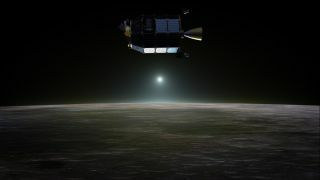 Artist’s concept of NASA's Lunar Atmosphere and Dust Environment Explorer (LADEE) spacecraft in orbit above the moon as dust scatters light during the lunar sunset. NASA's newest lunar probe is gearing up to begin the final phase of its month-long trek to the moon. The space agency's LADEE moon dust spacecraft is in its third and final orbit around Earth before moving to the moon, and everything is looking good. The lunar probe launched into space on Sept. 6 to begin its circuitous route to the moon. LADEE's second burn, designed to take it into a high elliptical orbit, was so "perfect" that the third maneuver planned to take the probe into an even higher orbit will not be necessary, NASA officials wrote in a mission update on Sept. 27. The loveseat-sized probe will make its final close flyby of Earth Tuesday (Oct. 1). After its last close approach, "LADEE will travel to the point at which it will be captured around the moon using an initial Lunar Orbit Insertion (LOI-1) burn of the onboard main engine," Butler Hine, LADEE project manager, wrote. "After that, LADEE will be in lunar orbit." LADEE's name is pronounced "laddie" and is short for the Lunar Atmosphere and Dust Environment Explorer. Since the probe began orbiting Earth, scientists on the ground have successfully tested the spacecraft's three science instruments and laser communications experiment. The spacecraft's antenna that will be used to send information to the ground is also functioning well. LADEE is expected to transfer into lunar orbit on Oct. 6. The healthy instruments will be responsible for investigating some long-standing mysteries about the moon's thin atmosphere and strange dust when it is expected to enter the into moon's orbit on Oct. 6. The thin atmosphere of the moon represents the most common known kind of atmosphere in the solar system, NASA scientists have said. By understanding the composition of the moon's atmosphere, researchers might be able to more accurately classify the atmospheres of large asteroids, many moon and even small planets like Mercury. LADEE is also designed to look into a strange glow Apollo astronauts saw on the horizon of the moon before sunrise. The glow may have been created by small dust particles lofted high into the lunar atmosphere, and data collected by LADEE could help scientists nail down an answer to that moon conundrum. The $280 million LADEE mission launched to the moon atop the first flight of a Minotaur V rocket booster on Sept. 6 from NASA's Wallops Flight Facility on Wallops Island, Va. Once in orbit around the moon, LADEE is expected to perform 100 days of science.